The most amazing journey of my life has been those three years in SSJSMM. Not just studies, but it also offered a lot of platforms for me to perform. I got to choose the path I wanted to follow in life. Luckily for me, my college provided the stage for me to showcase my work. Thanks to the fantastic Principal ma'am and lecturers for being so supportive and for guiding me . Thank you SSJSMM for making my dream come true. 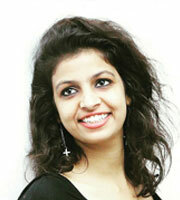 Geetanjali is now RJ Geetu just because my college believed in me. My love and gratitude to all.